In an inactive quarry in southeastern Ontario, a series of tracks line the surfaces of fossil dunes. These scurry marks, laid down as long as 500 million years, may be the oldest known footprints on land. Their makers may have been amphibious creatures and could mark the transition from marine- to land-dwelling species. Robert MacNaughton of the Geological Survey of Canada and colleagues report in this month's Geology that a type of arthropod took a jaunt over some sand that was either dry or damp at the time. The tracks that were left behind vary from deeply set appendage marks, sometimes with central drag grooves, to lighter imprints that could have been made in dry sand. The rocks themselves show marks of eolian, or wind-deposited, beds. MacNaughton says that past researchers believed that storms washed the animals who made the tracks into the inter-dune areas and then submerged them underwater. "In all the time that we spent looking," MacNaughton says, "we never found any evidence that this was the case." Ephemeral streams may have traversed the dune field, but the researchers found no evidence of standing water in the layers with the tracks. Overlying deposits from a shallow marine environment indicate the region may have been a transitional marine environment, contributing to the hypothesis that these arthropods were amphibious. Field photographs of representative arthropod trackways in Cambrian-Ordovician sandstone near Kingston, Ontario. The above image shows a robust trackway with well-developed appendage marks and no central drag. Note push-ups of sand associated with appendage impressions. Photos courtesy of R. MacNaughton. MacNaughton's team report that the tracks themselves show that the creatures were similar to a large centipede, some of which had a spiny tail like a horseshoe crab's. At least eight pairs of legs carried one of these large arthropods, with tracks as wide as 13 centimeters. The individuals walked with an "in-phase gait," a trait associated with swimming and other underwater movement. Because the tracks vary in size, several individuals probably made them, and the authors hypothesize that they were foraging for food or preying on other smaller amphibians. Another possible pastime could have been mating, just as horseshoe crabs come ashore to lay their eggs and return to the sea. This photo called taildrag, shows a trackway with central drag and poorly defined appendage marks. Top surface. Surface dips to top of photograph. 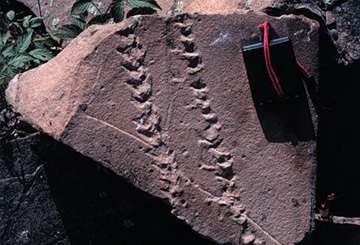 If these sandstone rocks are correctly dated, the timing of this fieldtrip pushes back the earliest footprints of a creature on land by about 40 million years, to the Late Cambrian. Fossil deposits in younger rocks give the youngest possible age of the deposits of being Early Ordovician, but the oldest possible age is not well constrained. The tracks occur in sandstone deposits related to a formation that begins in New York. Traveling north is like taking a ride forward through time. Because the tracks are in the southern region of the deposits and low enough in the formation, the researchers think they are likely from the Late Cambrian. "It would be nice to see these types of fossils in deposits with better time controls," says James Whitey Hagadorn, a paleontologist at CalTech in Pasadena, Calif. "We need to look into earlier eolian and marine environments for evidence of animal life." This "fantastic discovery," Hagadorn says, invites paleontologists to revisit the assumption that there's no life on land in the Cambrian -- a geologic time period where it may be worthwhile to look for further evidence of terrestrial incursions.